Majestic native oak trees dot the hillsides of Marin County and add to the county’s natural beauty. Following is a summary of the benefits of oak trees, a quick primer on how to identify and care for them, and the latest on Sudden Oak Death. Oaks provide numerous environmental benefits, including shade and shelter and a host of recreational opportunities for people, plus habitat for a multitude of critters from insects to birds to furry inhabitants. They help maintain a healthy balance of beneficial insects to keep destructive bugs in check. In fact, an oak tree is host to more than 700 insects and numerous bird and animal species. 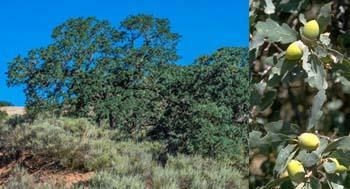 The native oaks that grace our hillsides help control soil erosion, making these areas safer for everyone. Oaks also provide a financial payback to homeowners, increasing property values with their beauty alone. Bottom line? Oaks are good investments — for homeowners and the environment. There are 20 native oaks in California, shading the hottest hillsides and edging the cooler coastline. Of those, eight are native to the North Bay region. Each has its own distinctive growth habits, bark color, leaf structure, acorn color and shape. The coast live oak (pictured to the right), California black oak, valley oak, Oregon white oak, and blue oak are the most common native oaks found in Marin County. Here’s how to determine what’s growing on your favorite trail — and maybe even in your backyard. 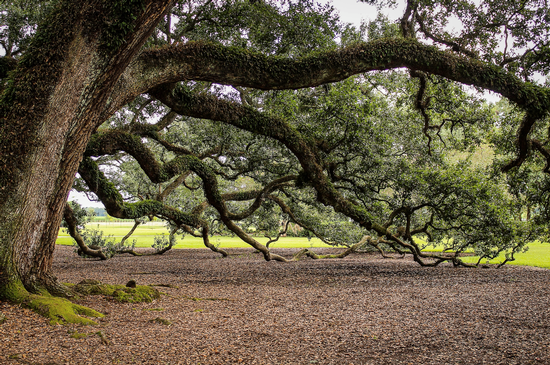 The coast live oak is an evergreen tree that typically has a multiple-branched trunk and a broad, dense crown with foliage often reaching the ground. A typical tree can reach 20 to 40 feet tall and live for 125 to 250 years. Smooth gray bark splits as it ages. The roundish, cup-shaped leaves are 1 to 3 inches long and spiny-tipped, typically dark green and shiny above and gray, rusty, and fuzzy underneath. The California black oak is a deciduous tree with a broad and round crown, its lower branches nearly touching the ground. These trees grow 60 to 90 feet tall and have smooth gray young bark that becomes deeply furrowed and dark brown to black as it matures. They usually live 100 to 200 years. Leaves are 3 to 7 inches long, dark yellow-green above and pale yellow-green below, cut into five to seven lobes with a soft bristle on the tip. This oak is also known as the kellogg oak. Valley oaks are deciduous trees 40 to 120 feet tall with deeply checkered gray-brown bark. They live 200 to 250 years. In advancing age, the branches droop, arch, and take on irregular shape. The deeply lobed eaves are 2 to 4 inches long, leathery, shiny dark green-yellow above and grayish below. This oak is also known as the California white oak. The Oregon white oak is a deciduous tree 50 to 80 feet tall with thin, ridged, grayish-brown bark. It can live for 100 to 200 years. Leaves are 4 to 6 inches long, shiny dark green above and pale green below, with even and deep lobes. This tree looks very similar to the valley oak. One way to distinguish between these trees is by the acorn shape: valley oak acorns tend to be long, narrow, and very pointed, while the white oak acorn is more rounded. This oak is also known as the Garry oak. The blue oak is a deciduous tree that typically has a broad, dense crown. A typical tree is 20 to 60 feet tall with gray-brown checkered bark. These trees live for 175 to 450 years. The powdery blue-gray leaves are 1.5 to 3 inches long and oval, with rounded tips and wavy or slightly lobed edges. Here’s where you can learn more about identifying oak trees. If you have an oak on your property, take note of what to do — and not do. Err on the side of less maintenance versus more. There’s a reason why ancient oaks thrive in undisturbed areas: no one has fed, watered, or pruned them. Prune judiciously. Only prune during dry weather when open cut wounds are less susceptible to infection. Remove as little foliage as possible. Keep cuts small. Do not alter the natural shape. Protect roots from heavy foot traffic, parked cars, and construction. Anything that compacts the soil or raises the grade is potentially harmful. This includes pavers and other hardscape surfaces. Every time an oak grove is turned into a housing development, you can be sure the trees will suffer (and sometimes die). Unfortunately, too often little regard is given to an oak’s root-protection zone, which is the area between the trunk and the edge of the canopy. Simply leave fallen leaves and apply a layer of mulch. Rely on experts. The best person to give your tree a checkup is a licensed arborist with significant oak tree experience. Some of the telltale signs of trouble are dead or decaying branches, oozing wounds on the trunk, yellowing foliage, and reduced vigor from one year to the next. If your oak looks unhealthy, contact the Marin Master Gardener help desk at 415-473-4204 or via email at HelpDesk@marinmg.org. Feed your oak trees. If your oak looks unhealthy, it’s probably because of a disease related to an unfavorable environmental condition. 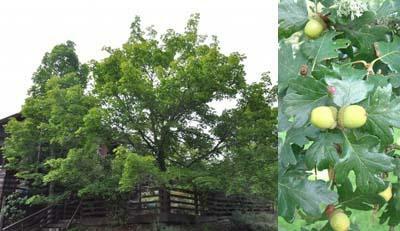 Feeding your oak may stimulate excessive leaf growth and encourage pest problems. Improperly applied, it can injure roots or burn foliage. Panic if your oak looks unsightly. Some pests and diseases can be unsightly but not harmful, such as the oakworm, which can practically defoliate a tree. Oaks are tougher than you think and will often recover without treatment. Water your oak. The only reason to plant a lawn under an oak is if you want to kill it. Oaks want it wet in winter and bone dry in summer. Period. Oak bark is not adapted to summer moisture, and wet summer roots are prime candidates for deadly diseases. Most oaks die within ten years if irrigated in summer. The one exception is during periods of severe drought, when many oaks will die without supplemental water. In this case, water deeply once or twice per summer, no more. 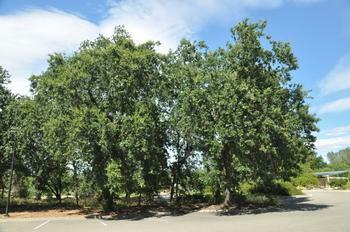 Sudden oak death (SOD) is a disease that affects native oak trees in California. SOD currently occurs in coastal California from Monterey to Humboldt and in a small portion of southwest Oregon. It is estimated to have killed more than 1 million oak and tanoak trees during the last decade. Although sudden oak death is a forest disease, it is common in urban-wildland interface areas — that is, places where development meets or intermingles with undeveloped wildland. SOD is caused by a pathogen called Phytophthora ramorum that thrives in coastal redwood forests and oak woodlands within the fog belt. Areas outside of these cool, moist areas often create microclimates that mimic an environment supportive of P. ramorum and allow it to grow and spread far from the coast. 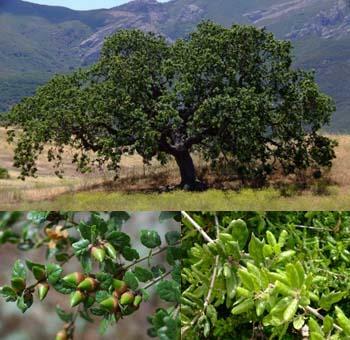 Research in California forests has shown that the greatest predictor of P. ramorum on oak is the presence of California bay laurel trees (Umbellularia californica). Pathologists believe the pathogen drips or is blown down onto oak trunks from neighboring bay leaves when it rains. Once on an oak trunk, P. ramorum uses natural openings in the bark to colonize the bark tissues, killing cells, and clogging water and nutrient-transport vessels. Coast live oak, California black oak, Shreve’s oak, and canyon live oaks are susceptible to the pathogen P. ramorum and develop a bark canker when infected. 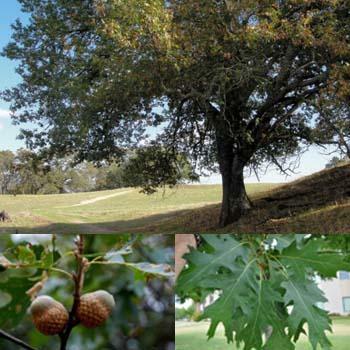 Valley oak, Oregon white oak, and blue oak are not thought to be susceptible to sudden oak death. Diagnosis of infected trees and proper disposal of contaminated wood and other material are essential to limiting the spread of the disease. Symptoms of a bark canker may include the bleeding of a thick, sticky sap. It typically smells like the inside of a wine barrel and is usually deep burgundy, but it can vary in color from black to amber-orange. Rains can cause the sap to run, often producing large stains on the surrounding bark. Only larger trees with a trunk diameter greater than four inches at chest height show symptoms; infections of smaller saplings are extremely rare. Mosses and lichens growing on the tree trunk die if the sap comes in contact; this can be the only indication a tree is bleeding. This bleeding is the external manifestation of an underlying diseased area of the tree, or canker. Cankers usually develop three to six feet from the ground, although they can be as high as twelve feet or greater. Bleeding sap initially appears on intact bark without any obvious holes or wounds, although in later stages of the disease the bark might split. P. ramorum infections on oaks were originally called “sudden oak death” because of the rapid (two to four-week) browning of leaves without a prolonged period of visible decline. The foliage might appear healthy until shortly before it turns brown, or the leaves might turn olive green, pale green, or yellow green for several weeks to several months before browning. Infected coast live oaks also might lose leaves before dying. While this browning of leaves can appear suddenly, it usually occurs more than two years from the onset of a P. ramorum infection. SOD management options include treatment with phosphonate compounds and selective plant removal. One phosphonate fungicide called Agri-Fos is registered as a preventative treatment for P. ramorum for use on individual high-value oaks. Treatment is not recommended in areas where infested plants are not already present. This treatment is not a cure, but it can help protect trees from infection and suppress disease progression in very early infections. The phosphonate compound can be injected or mixed with a surfactant and sprayed on the trunk for absorption through the bark. Booster treatments must be made every one to two years. Experts at the University of California Department of Agriculture and Natural Resources provide specific guidelines and application protocol for applying Agri-Fos. Since the treatment must be made to healthy trees and the pathogen’s distribution and activity is somewhat unpredictable, it is difficult to determine which trees need treatment. Trees selected for treatment often include healthy, high-value oaks within 150 feet of other infested plants or surrounded by California bay laurel trees where there are known infections within 150 to 1,000 feet. Here’s where you can learn more about oaks, including the latest on Sudden Oak Death and best practices for SOD management. Original articles by UC Agriculture and Natural Resources and Marie Narlock. Edited for the Leaflet by Lisa MacCubbin.